If you have been on Instagram lately, you might have noticed some unusual photographs. It all started with THIS POST on Rant Chic. In this post the author lists 24 things women should stop wearing after the age of THIRTY. Well, you can just imagine the controversy and outrage a post like this stirs up. Most readers think the list is ridiculous. And I agree. And some people think the list is meant to just stir up controversy and get women all worked up, providing lots of 'hits' to this page. I agree with that too. But for me personally, it was just another endless post or statement of someone telling me what I should or should not wear, and I didn't like it. So, when I read that Catherine, from Not Dressed As Lamb, was conducting a playful little social media game to show what women over thirty think of being told what not to wear, I decided to play along. You can read all the details HERE, but basically you just wear something that's on the list (that your told not to wear if your over thirty), take a picture of yourself wearing the item, and hashtag it #IwillwearwhatIlike, on whatever social media you use. Since I use Instagram, I've been posting there. The social media game started August 1 and runs everyday until August 31. This is me, at 52 years of age, wearing my husbands vintage band T-shirt that he bought when he was at a concert during his high school years. The shirt is thirty three years old! He has kept it in pristine condition because it's one of his favorite bands and memories. But after I tried it on I liked it so much I said "I don't know hon, this looks so good on me I might have to actually wear it to sometime!". This type of T-shirt is really back in style now too! And I paired the shirt with another no-no for women over-a-certain-age: cutoffs! Sorry fashion gods, but I have lived in cutoffs every summer for my entire life, and I think I will probably even be wearing them when I'm in my nineties! On August 1st the fashion "don't" was over sized sunglasses. 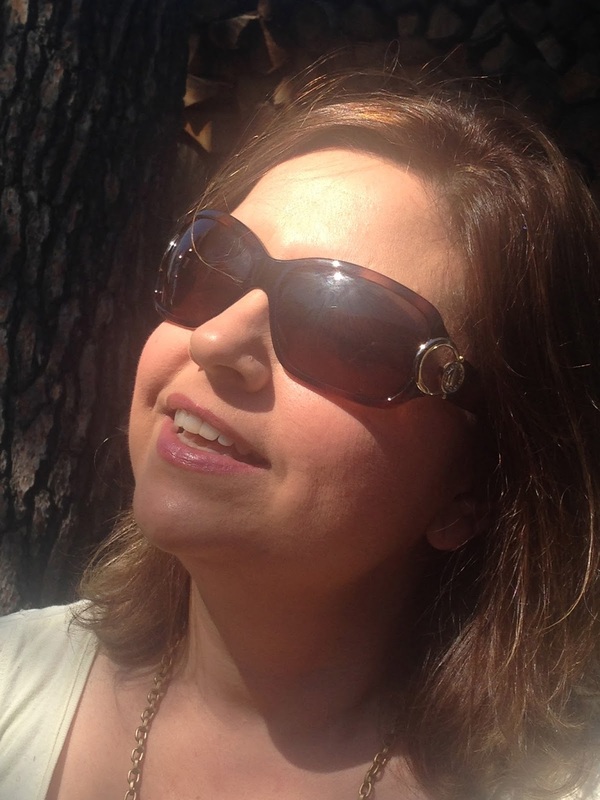 I was like really, women over thirty can't wear over sized sunglasses? Aren't sunglasses suppose to be all about eye protection? The bigger the better as far as I'm concerned! So I took this picture wearing the largest pair of sunnies I had, smiled, and soaked up the sun! Today is Candy Pink, so this I put on a candy pink lace top. You can't get more girly than this! Pink is such a soft and flattering color. Everyone looks good in it. I know traditionally pink is known for little girls, but I love to wear it too, so I will! Now, if you want to play along with us, and I really hope you will, here is the list. If you don't have everything on this list, and I certainly don't, then just don't play that day. And you don't have to wear the items in order either. I will be doing the list in order (if I have the item), and posting here and on Instagram. I'm really having a lot of fun with this. I like seeing what all the other ladies are posting on Instagram too. It's fun seeing women coming together in social media and standing up for what they believe in, in a humorous and playful way. You look so cute, Amy! And such the rebel, too!! LOL!! Haha...I hadn't seen that instagram post! I just turned 30 so I'm definitely curious as to what I'm not allowed to wear anymore! Honestly though, I kind of agree with the list :-/ That being said I think there is a classy way to pull off pretty much any of those items. It's just that as a general rule (especially for people that don't have much fashion sense) I think it's probably a good idea to avoid most of those items. But you definitely have fashion sense so I wouldn't worry about it! yes! you wear what you want girl, and you rock it!! Haha, I'm 30 and I wear a ton of stuff on that list! Love the graphic tee- it's cute! Fun post! I was shocked to see some of the items on the list, and then some other items made sense. This would be a fun challenge to play along in. SUperb look for summer ! cool ! Ha - you always crack me up, Amy! Yea, these lists of things are just ridiculous in my opinion. As long you feel good in it, that is the only thing of consequence. You look so cute in your hubby's vintage tee and your cute cut-offs! I just love it. That list is ridiculous! I mean seriously. Anything sleeveless? Long hair or pony tails?! Good grief! Maybe I shouldn't even leave the house! I think you look fabulous in all your outfits! Keep on rocking it out! Wow! What a list! It's actually funny how many things I wear on that list! Oversized sunglasses, leopard print, distressed denim.... I'm loving this idea of taking a picture and sharing how you can wear what you like and feel comfortable and confident. I might just have to join in!! These are fun. 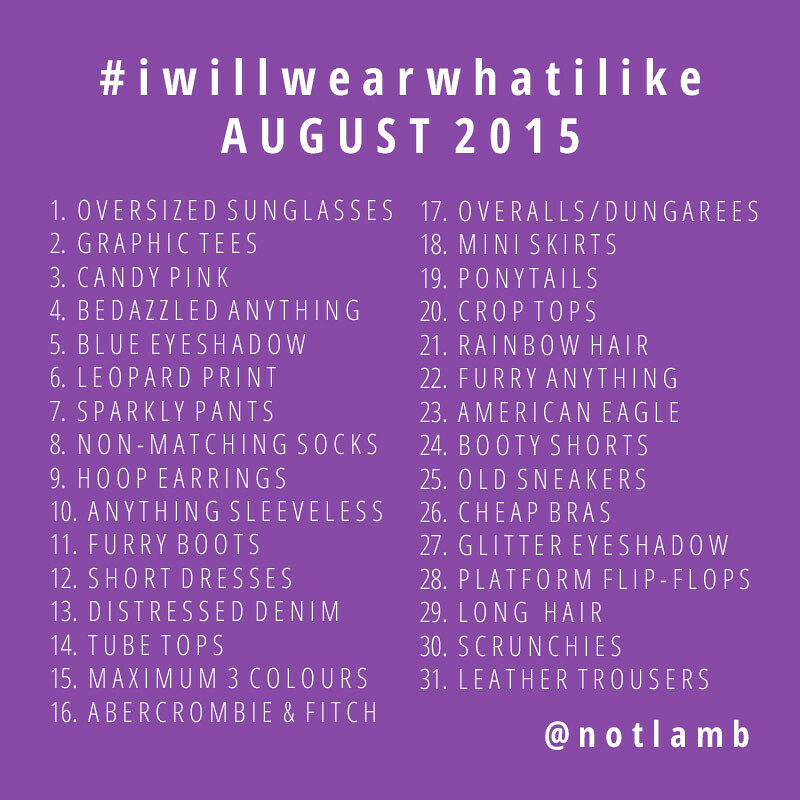 So glad you're doing #iwillwearwhatilike. Catherine and I were candy pink twins on Tuesday! We both wore pink skinnie jeans! These are such a great summer outfits! I just turned 30 and wear all of this too-wow what a list but you rock it all well so far and I can't believe people buy the "can't wear at said age stuff: haha! So rediculous! Yes, who comes up with these rules anyway! I am on vacation, so I would have participated more, but Love the lace top and say yes to what you are wearing! THank yuo for linking up with real Mom Style. Firstly I cannot wait to read that post and the details on the other. What the heck, I can wear whatever I want and I'm glad you rocked these looks! !